Your central heating boiler is the central part of all heating and hot water systems. Whether you have a combination boiler or a conventional boiler with a hot water cylinder your central heating system is the centre of your homes comfort. 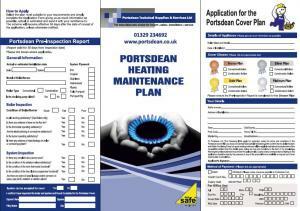 With Portsdean cover, you can gain peace of mind from those unplanned maintenance issues that crop up. With normal wear and tear mechanical items in your boiler and central heating system will inevitably start to wear out and may develop faults. With the cost of calling an engineer out increasing due to fuel costs and training costs a simple engineers call could cost between £60 and £100. 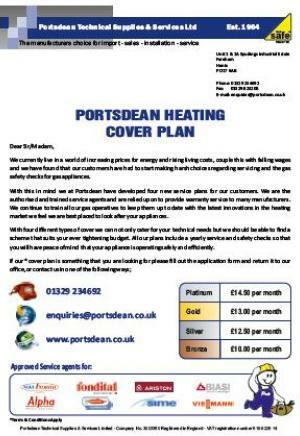 Portsdean cover offers all of our customers the chance to protect themselves against costly repairs and breakdowns. With a range of cover from a simple bronze package which enables you to have a yearly service and covers parts required on your boiler to an all encompassing Platinum package which also includes all Labour costs and after our callouts. As our engineers are trained in the repair and service of most major manufacturers boilers, we can offer a quick response and quality service to our maintenance plan customers. All maintenance plans are accepted only after an initial service visit from our engineers to check the system to ensure that the starting point of the maintenance cover matches the requirements of our terms and conditions for the maintenance plan. 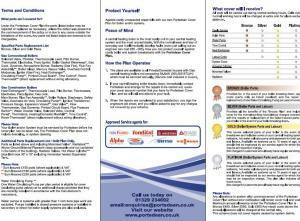 Or click here to upload a standing order form..